Depart from London Heathrow early evening taking the KLM flight via Amsterdam overnight to Windhoek. Dinner is served after take-off. Arrival in Windhoek late morning. 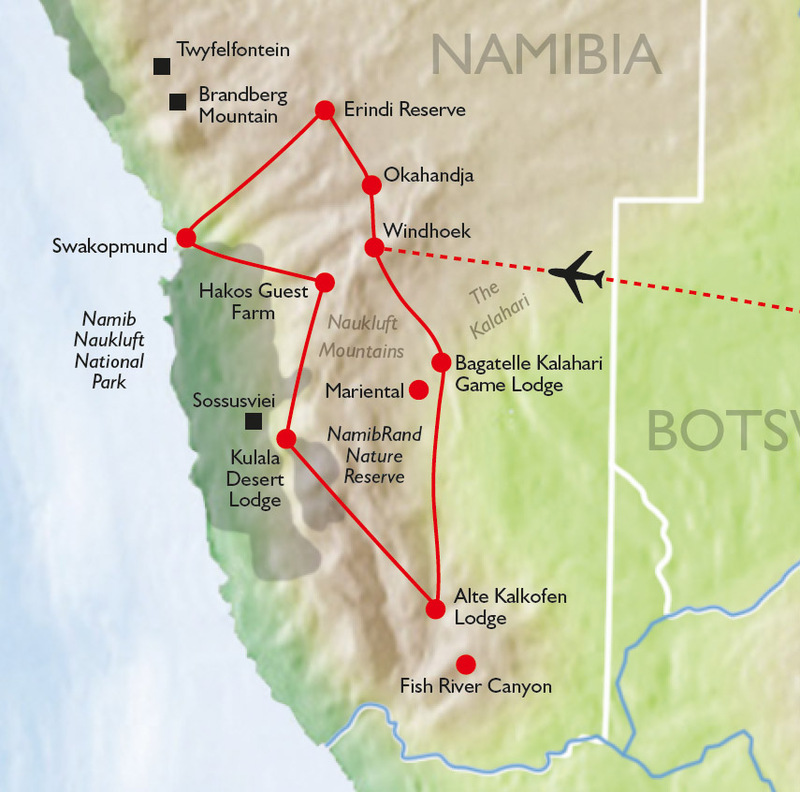 You are met at the airport by Susan and our local guide, Siggi, to start the journey southwards to our lodge in the Kalahari Desert, south of Windhoek. The lodge lies amid deep-red sand dunes, salt pans and savannah plains. Late afternoon game drive for an introduction to the local wildlife and vegetation, stopping for a sundowner. We enjoy dinner together around the Boma fire. The Bushmen (San people) live in the Kalahari and we join them for an early morning walk to learn about traditional uses of plants. Time to relax at the lodge until the afternoon game drive in the undulating red dunes where we can spot giraffes, oryx, kudu and perhaps meercats and ostriches. Magnificent camel thorn trees (Acacia erioloba) and bushman grass (Stipagrostis sabulicola), and a poisonous but beautiful lily, grow between the dune ridges. After watching the sunset whilst enjoying a sundowner, we return to the lodge for dinner. We travel south, leaving the dunes, and passing through the mountainous Namgorab region with extraordinary geology, we arrive at the village of Helmeringhausen for lunch. It is a well-known auction centre for sheep and goats farmed locally. We may see the sociable weaver -bird colonies located in a camel thorn tree. We arrive at Alte Kalkofen Lodge in the afternoon, allowing time to relax. An excellent collection of lithops (stone plants) from southern Namibia and northern South Africa will be shown to us by the owners, who are collectors. Morning visit to the magnificent Fish River Canyon, which is the second largest in the world after the Grand Canyon in the US. Walk along the ridge with impressive views and discover the majestic but poisonous candelabra euphorbia (Euphorbia virosa) and the quiver tree (Aloidendron dichotomum). We check into the Gondwana Canyon Lodge and enjoy a sundowner before dinner together. Heading north, we traverse the Gaub Pass to enter the sweeping plains towards the Naukluft mountains and arrive at Kulala Desert Lodge on the edge of the desert, our base for two nights. 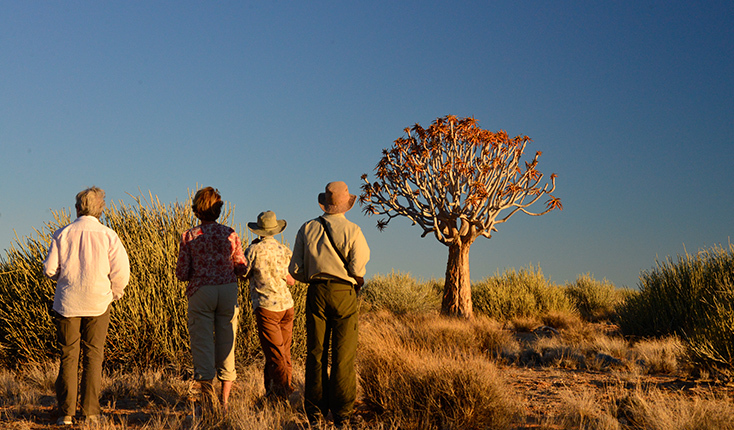 Our early evening game drive in the extensive reserve gives a fascinating insight into desert life. Return to the Lodge for dinner. 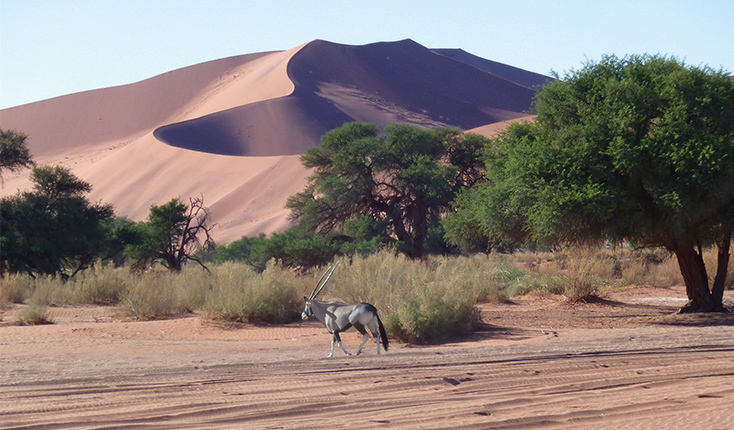 We start before sunrise, entering the Namib-Naukluft Park in a Land Cruiser and travelling along the Tsauchab riverbed towards the high dunes, with frequent stops along the 60 km track to Sossusvlei. 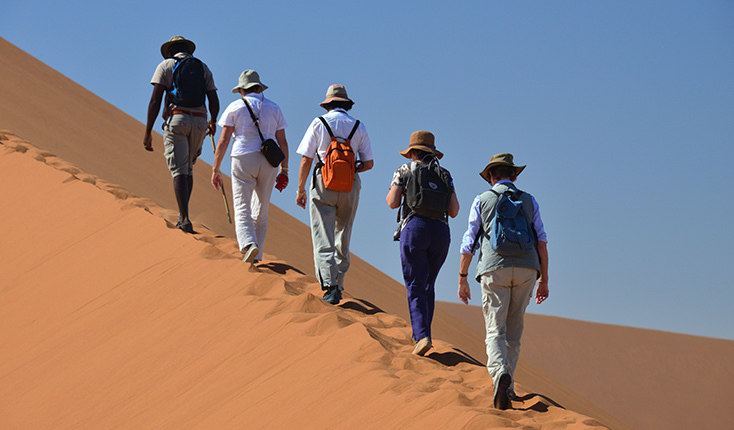 Walk up the dune to the Dead Vlei with its ancient dead acacia trees in the saltpans. The dune colours are breathtaking in the early morning light. We stop for brunch under a camel thorn tree in the Sossusvlei pan on our return from the dune walk. Late afternoon we enjoy a drive on the Lodge’s private reserve to watch a spectacular sunset over the savannah plains towards the mountains and dunes. Dinner is notably atmospheric and delicious: a braai (barbeque) specially prepared for us by the Lodge staff and set in the bush around a Boma fire. You may, if you wish, bring the day to a perfect close by sleeping under the stars on the roof of your room. We depart through the mountains to arrive late afternoon at Hakos Guest Farm facing the Gamsberg mountain at 2347m. Sunset walk including the planet trail for a sundowner before enjoying dinner with the family. Later, there is an opportunity for a guided stargazing session (with access to a powerful telescope) as Hakos is an exceptional site for astronomy. Morning guided botanical walk on foot from the farm with ecologist Uschi Pond along a mountain ridge to explore the local escarpment flora; birds; and maybe the protected mountain zebra. Afternoon nature drive by 4×4 with the opportunity to discover some geological highlights. 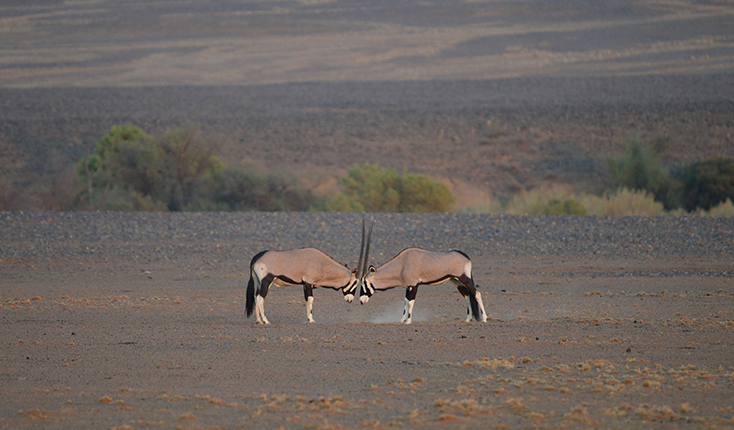 Oryx, kudu and zebra may be seen as we watch the sun go down before dinner together. After-dinner presentation by Uschi of the local flora in the rainy season, with a focus on Welwitschia mirabilis: Uschi has co-authored a recently published book about the plant. We depart from Hakos through the mountains towards the coast, with a diversion to view the ancient Welwitschia. These rare plants may grow to over a metre high and live for centuries – possibly even a thousand years. They are adapted to grow in arid conditions, receiving moisture from regular early morning fog rolling inland from the sea. Continuing along the desert-like landscape, which becomes like a moonscape with amazing geological formations, we arrive late afternoon in Swakopmund on the Atlantic coast. The city’s German origins are quite pronounced: the beautiful old German colonial buildings make an even starker contrast at the edge of the Namib Desert. We have dinner in the hotel restaurant. Morning excursion into the desert where, in the dune belt, we are shown Palmato geckos, desert chameleon, the white lady spider and vegetation surviving in the dunes. In the afternoon in Walvis Bay we discover the lagoon, one of the most important wetlands of southern Africa and a hibernation area for migratory birds. The eye is caught by the flamingos, black oyster catchers, avocets and plovers. Reservation for dinner at the restaurant “The Tug” on the sea shore. 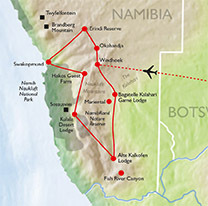 Depart for Erindi Old Traders’ Lodge in 70,000 hectares of pristine wilderness. Superb sightings of wildlife both from the deck of the lodge and during the game drives. We enjoy a late afternoon game driver until after sunset returning to the lodge for dinner. 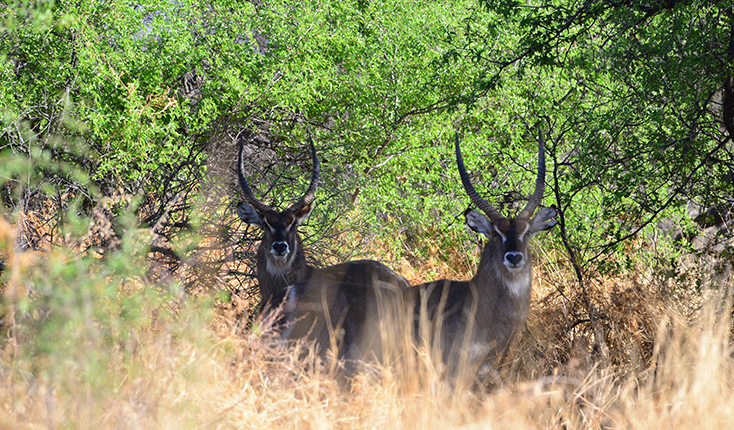 Early morning game drive to discover a rich variety of wildlife. flora and birdlife. We return to the lodge for brunch. Relaxing day watching birds and small mammals visiting the waterholes, until tea and cakes in the afternoon followed by a sunset game drive to discover more of the wildlife on the reserve. Return to the lodge deck terrace for dinner. Depart after breakfast for the final drive south to Windhoek airport taking the KLM flight overnight via Amsterdam to London Heathrow. Arrival at London Heathrow early morning. Our November 2017 tour to the Namibia Deserts, Dunes and Canyons is described in our blog – tour report. Click here to read the full article. All air flights, land transport, accommodation in lodges or hotels, delicious meals, local guided game drives, walks and all National Park entrance fees. Professional guide/driver throughout, accompanied by Susan Worner. Water supplied on coach. Drinks, lunch when travelling, tips for driver/guide, lodge and ranger guide tips, items of a personal nature. Comprehensive travel insurance with full cover to be taken out on payment of the deposit. Guests should be aware that daytime temperatures may be high, although it will be cooler at night. Travel days are quite extensive, with transport by comfortable, air-conditioned vehicle built to cope with the rough roads. Some walking in the dunes is included as well as the botanical walk with rough tracks on the mountainside. The climate in November is hot and very dry with nights that are cooler but warm enough to sleep on the roof under the stars at Kulala Desert Lodge! Insect repellent is advisable, though the dry climate does not encourage insects to thrive. No malaria medication or yellow fever jabs required. Up-to-date Tetanus is recommended, as it is for all outdoor people. 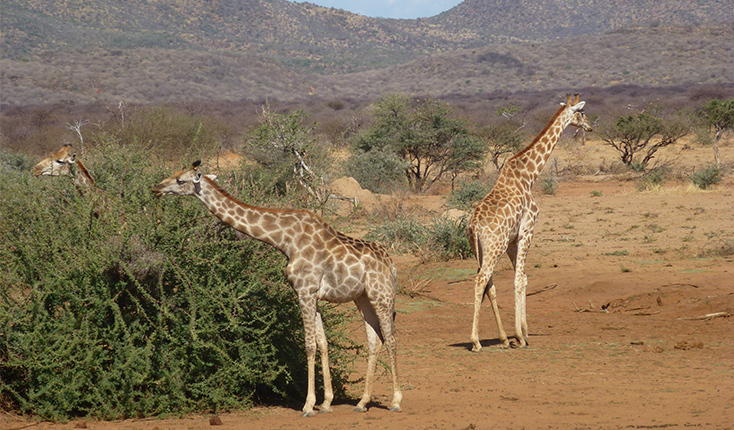 Lunches in the form of brunch are provided on return from an early morning game drive. When we are travelling between lodges/hotels, we stop for a light snack en route (not included). Very limited Wi-Fi access is available in the lodges, sometimes not at all. 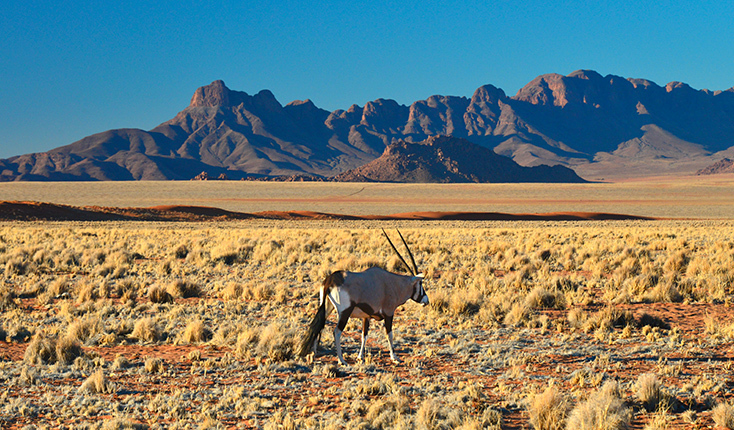 Namibia is a very safe country where the indigenous people are friendly and helpful. English is spoken everywhere. South African Rand is accepted in addition to the local currency, Namibian Dollars.